For a long time I thought making homemade granola was scary. All the recipes I saw had a ton of ingredients, and it involves the oven. Ovens are scary. And hot. I finally had to start doing it when we were going dairy free for for my daughter because every single cereal in the store had at least whey in it. I cook like I garden, haphazardly. So the awesome thing about the crock pot is you can have it cooking slowly while you run around like crazy. You can take care of other things around the house and only stir occasionally. Because believe me, hovering over the oven, waiting for the granola to turn the perfect shade of light brown is a recipe for disaster. Especially if you have small kids! The margin of error is so much more forgiving for crockpot granola! Chop up the almonds. Melt the butter or coconut oil. Mix all the ingredients together in the crockpot, add more oats if it’s really moist. Cook in the crockpot for about an hour then start stirring every few minutes until the oats are more crunchy then chewy. (You could always skip this part and forget about it for a few hours and have really really really crunchy granola plus a nice charred granola chicken treat on the bottom of the pot). I now understand why everyone used to tell me granola is super easy to make. Because it is! 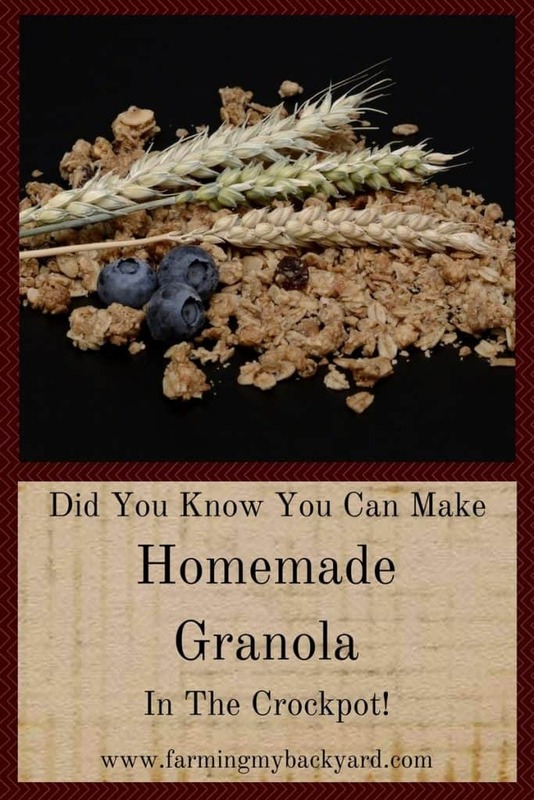 If you are looking for a super duper easy to make granola recipe, then you really should try this one. 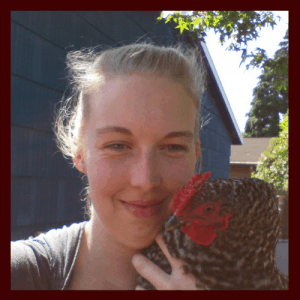 When you are doing things from scratch and trying to grow your own food and raise animals, life can get really busy super fast. Heck life gets really busy super fast even if you DON’T do any of that stuff. That’s why I’m a fan of super easy recipes. If you liked making granola, perhaps you’d like to try my super easy peanut butter fudge recipe next! Thank you for this lovely recipe! I made mine in a Ninja. It turned out great! If you haven’t heard of the Ninja you should check it out! It has a stovetop function with 3 settings, slow cook with 3 settings, and you can bake with a dial setting the oven temperature. I homestead like you cooking all meals from scratch. I cannot tell you how many meals have come out of this machine! It is almost like a game to me–what can I cook up in this Ninja today! I really bought this over the traditional crockpot so I could bake food in the summer without roasting us out of the house! I know you said space is a premium, but this tool will earn its keep! I made my granola with dried bananas, currants, coconut and sunflower, I used 4 cups oats. I added one stick butter, about the same in coconut oil, maybe a 1/4 cup peanut butter, 1/4 honey (from our bees), and a couple dashes of vanilla, 1 tsp cinnamon, and maybe 1/2 tsp sea salt. It took about 40 minutes in the Ninja on bake at 275 degrees. I removed it and spread out on baking sheets to cool. Husband had a bowl right away. Always nice to make something special for him! Thank you again! The Ninja sounds neat. Our crock pot is on its last leg so I’ll have to check it out. Your granola sounds super yummy! You can never go wrong with peanut butter!